This Lowel TotaLED Daylight LED 2-Light Kit put together by B&H includes two TotaLED Daylight LED lights and two air-cushioned light stands. The TotaLED floodlight features a 750W tungsten equivalent, upholding the brightness standard of the original Tota light. Each light in the kit has 160 5600K LEDs, a large heatsink with fanless design to keep the light cool, a 100° beam angle, a V-mount battery plate, a built-in yoke, features 100-0% stepless dimming, weighs less than 5 lb, and comes with a carry case. 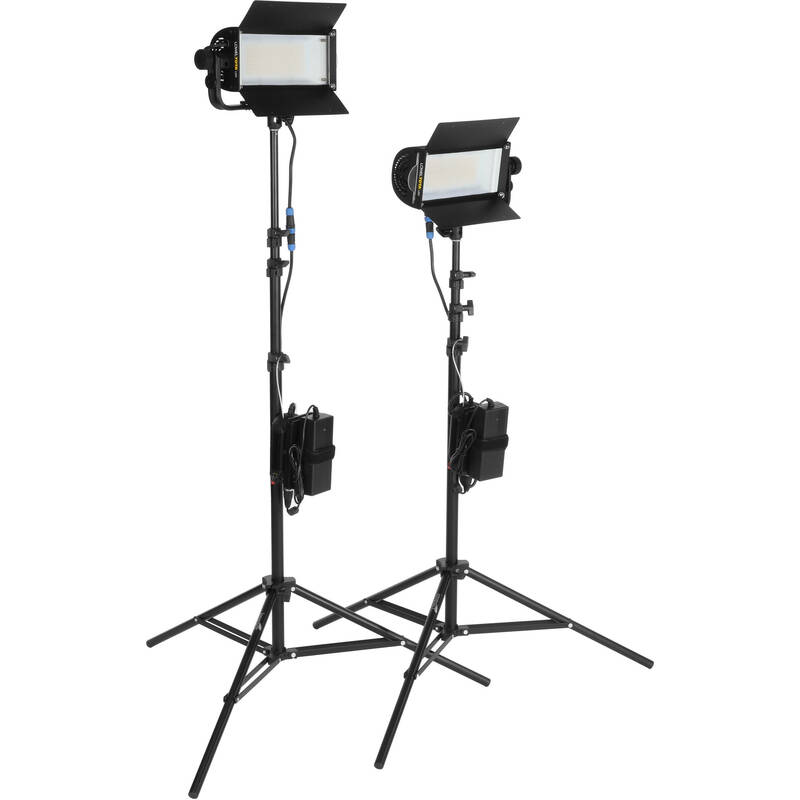 The included 4-section light stands support up to 8.5 lb and extend to a maximum height of 121.5". See below for more information about the items in this kit. TotaLED Daylight LED 2-Light Kit is rated 4.0 out of 5 by 1. Rated 4 out of 5 by Michael from SMART BUY for Location Filming I saw the promotion with the free V-Mount battery and charger and I felt this will be an upgrade to my current lighting setup (coming from LED Flex Panel) for building up my location filming setup. I feel theres more pros than cons with this light but you cannot beat free v-mount batteries with charger for the price!!! Pros: - can light up a small/medium size room - all metal casing which feels and look professional - comes with carrying case and v-mount battery and charger - longer power cable for mounting on C-Stands - umbrella clamp on mount for additional diffusion Cons: - clamps on barn doors are tiny and not as strong to hold multiple gels - wish for side barn doors as an option to shape lighting more - seems like at %60 is as bright as %100 I still really like these lights so I ended up purchasing another one so I can have more options to light an outdoor/indoor scene or a small stage. Can these lights be used with soft boxes such as Chimera? Or are they not bright enough? At this time, Chimera does not produce a speed ring specific to this TotaLED light, therefore a softbox cannot be used with it. Are these bright enough to use for lighting a Green Screen? Yes. For sure. B&amp;H # (this item) LOTOTALED2K is 4275 Lux, with 750W Tungsten Equivalent.